Kenyan School/Orphanage Needs Your Help! Some of the beautiful children of "Little Angels"
Whilst visiting a little village Orphanage & School in Mombasa, Kenya, East Africa, we were saddened to see the heart rending conditions these children had to live & learn in, and have made the decision to try and help these beautiful people to build a village school. The land has been granted to them, but they do not have the funds to build a school. Their current building is a one room tin shed with no facilities at all, for which they must pay rent using the meager funds they have. This same shed houses at present 102 children, 3 teachers and a cook. Some of these children are orphaned; others only have 1 parent or are just poor, in general all are very needy. They vary in age from kindergarten, preschool & through to Year 3. 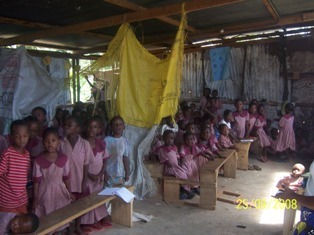 Most of the children sit on the dirt floor, as desks and chairs are a luxury they cannot afford. The estimate to build this school is around A$20,000-A$25,000 (Australian dollars). We ask for your help in raising the funds to send to this village. If you can help in any way, large or small, every cent helps! I know we have all seen various advertisements with requests for help for various needy causes, but I can assure you that every cent we raise will go directly to these children, no bureaucratic red tape fees or administration fees will be taken out! If you can help in any way large or small, please visit our website at www.littleangels.cfsites.org for full details and more wonderful photos of this incredible little school. Thanking you in advance...The Little Angels School of Hope! Comments for Kenyan School/Orphanage Needs Your Help! Through some amazing support from donations in Australia, England and other areas of the world, we have helped this small village school/orphanage to realise some small dreams. Where there used to be a tin shed, now stands a small but functional classroom to assist these beautiful little children in learning and receiving the education they so richly deserve. The second classroom is well on its way, and a vegetable garden has also taken pride of place, although what to do with those marauding monkeys, is another problem! Thank you to the many who have helped, and for anyone who would like to help, please make your donations at www.littleangels.cfsites.org and I assure you any funds raised will all go to the Little Angels to help them see their is hope and a future for them all. To all the wonderful people who have supported us through our mission to help these beautiful children - THANK YOU - we have raised enough money to make a small difference and I am pleased to advise that the first classroom has been built! It is such a wonderful feeling knowing these lovely children now have a classroom that they can sit in and learn and through this show them there is hope and a future. Of course we are continuing our fundraising to build more classrooms, but what a great achievement so far. Those who have donated or in deed kept us in their prayers, we thank you, we couldn't have done it without you. May the great God of Abraham hear your cry and come to your help. I promise to pray for you. I have oodles of photos of the kids taken this November and last May(about 200 maybe!!) - if you would like me to send you some... no probs!! Mwana and Kibibi told me about your fund raising efforts and your enthusiasm. my daughter organised a footie tournie and raised for the school. Mwana,Kibibi and Alwis (as Trustees of the charity) have just bought the land with this. Also, my friend is funding the build for one of the class rooms and I heard y'day that further funding is coming for a second classroom. See http://kikambalavillage.cfsites.org. So, Mwana's dream is becoming reality. You'll find further info about the school on www.tripadvisor.co.uk - look for Kikambala - new school @ royal reserve. Also www.justgiving.com/sianroberts for info about the footie! All power to the Internet!! And sites like Kenya-Advisor.com - Thanks!! Best of luck with your fund raising! Brigitte, your cause seems a worthy one and I hope you get some reactions to this. Good luck. Join in and write your own page! It's easy to do. How? Simply click here to return to Help Requests.